New research shows that ravens can plan ahead for different types of events, and even resist the urge to take an immediate reward in favour of getting a better one in the future. These capacities are often considered the exclusive domain of humans and great apes, so their presence in birds comes as a surprise. The study, published today in Science, shows that ravens (Corvus corax) can anticipate the nature, time, and location of future events based on prior experiences. This is an important finding, and not just because of what it tells us about certain birds and how freakishly smart they are. It also tells us that ravens and great apes — animals who diverged from a common ancestor over 300 million years ago — acquired these sophisticated cognitive planning abilities travelling along very different evolutionary paths. Animals that can’t plan ahead live in the moment, and act in accordance to immediate needs. Their lives are a flow of action and reaction, making it difficult, if not impossible, to think complex scenarios through. Animals that can anticipate the future, on the other hand, can use or build tools to perform a task, engage in bartering behaviours, and exert self-control. In previous experiments, great apes have demonstrated these capacities, but monkeys have not. Corvids, a family of birds that includes ravens, have also demonstrated the ability to anticipate the future, but only in simple experiments involving the caching of food. 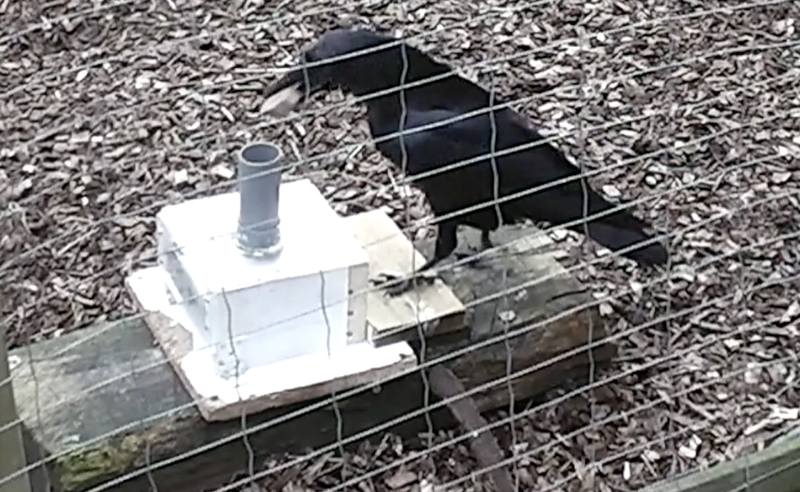 In an effort to learn more about raven intelligence, researchers Can Kabadayi and Mathias Osvath from the Department of Cognitive Science at Lund University conducted a series of experiments in which five ravens (two male, three female) were put through four different tests. These experiments were done to see if ravens could use their bird brains to complete tasks they wouldn’t normally have to perform in the wild, namely using tools and bartering with humans. The tests were also done to see if ravens could make decisions for an event 15 minutes into the future, and over a longer time frame of 17 hours. Finally, the researchers sought to test the birds’ self-control when making decisions for the future. In the first experiment, Kabadayi and Osvath taught the ravens to open a puzzle box with a simple tool, which they did to access a reward. Once trained, the ravens were then presented with the puzzle box — but no tool. The box was then removed, and an hour later, the ravens were given the choice of selecting the opening tool, and also some “distractor” objects. In experiments involving five birds, nearly every raven ignored the distractor objects, choosing the correct tool — even though the puzzle box was absent. When the ravens were presented with the box 15 minutes later, they used the tool to open it, and with a success rate of 86 per cent. Similar results were achieved in the second experiment, in which the birds waited 17 hours for the box to reappear. In a corollary to both of these tests, the ravens also showed the ability to select a token which they could later use to barter for a reward, which they did with 78 per cent proficiency. Fascinatingly, the ravens performed better in the bartering tests than orangutans, bonobos, and chimps, as shown in other studies. These experiments show that ravens can “select, save, and later use either a tool or an exchangeable token that acquired functionality” both 15 minutes and 17 hours after being taken, noted the researchers in their study. For the third and fourth experiment (again involving short and long time intervals), the ravens were presented with the correct tool, some distractor objects, and — in a delicious twist — an immediate reward. The ravens were allowed to choose just one. Importantly, the immediate reward was not as good as the reward inside the puzzle box, and the ravens knew it. As the researchers report, the ravens selected the tool, demonstrating a level of self-control comparable what’s seen in great apes. Nieder was particularly impressed with the amount of cognitive control exhibited by the corvids. The birds didn’t act hastily, immediately snatching an available food item. Instead, they appeared to inhibit this impulse and wait for an even bigger reward in the future, an ability termed delayed gratification. “Being able to wait and think things over before acting is at the core of intelligence and probably explains why corvids are so smart,” said Nieder. Alice Auersperg, a behavioural and cognitive scientist at Vienna’s University of Veterinary Medicine (also not involved in the study), was likewise impressed with the study. Alex Taylor, who studies crow intelligence at the University of Auckland, read the study a bit differently, and says the results are open to interpretation. Taylor says this is the key control — divorcing the token from food association — that’s missing from the study. The ravens may not be thinking about the future at all, and are instead just choosing the object with the strongest association with the food, i.e. the tool. Regardless, the new study is providing another fascinating glimpse into corvid intelligence, and the kind of smarts that are being produced by brains very different from our own. Previous studies have shown that, pound for pound, birds pack more neurons into their tiny brains than mammals, including primates. They even have a brain structure that’s analogous to the mammalian neocortex — the part responsible for higher order functioning like conscious thought, sensory perception, spatial reasoning, and language. Indeed, as evolution has shown time and time again, there are many different ways to reach a similar result.